"Mr. Robertson, I'm aware that you're from the CIA. But you're making a deal with these guys, and I think it isn't in the line of duty." MPAA Rating: R for violence. Woo Ping Yuen is best known in the West for his fight choreography in The Matrix series and Crouching Tiger, Hidden Dragon, but he has also directed 26 films in Hong Kong over the last quarter century. Born in 1945, early encouragement by his father led him to a series of stunt man/fighter roles, and he soon advanced to choreography, directing his first film in 1978. 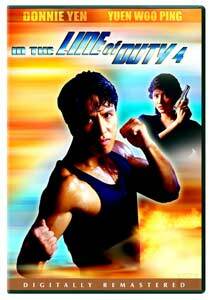 In the Line of Duty 4 was released in 1989, midway through his career. The CIA is the bugaboo this time around�they're involved in some shady deals involving drug smuggling. An exchange in a warehouse is observed by police operative the Black Cat, who's also taking photographs. He tries to arrest all parties involved, but is shot and staggers out, handing the film to the unsuspecting Richy (Yat Chor Yuen). Soon Richy's being pursued not only by the baddies, but also the police, in the form of Penny (Cynthia Khan), Donny (Donnie Yen), and Inspector Michael Wong (Michael Wong). They've been on the case for a long time, and they not only want to get the incriminating negatives, but also to protect Richy from a seemingly-endless parade of would-be assassins. Richy escapes to Hong Kong aboard a freighter, with our three intrepid police in hot pursuit. Richy visits his mom, who in turn becomes a pawn in the ever-increasing series of attempts to lure him in. Suspicions are aroused that Michael may not be all he seems to be. The plot becomes more and more complicated, even baroque as each of the characters is pursued, captured, wounded, and rescued. But the plot is definitely not the thing here. Complicated as it is, it's really just a skeleton to hang the action sequences on. And what action sequences�lots of martial arts fights, pursuits up and down buildings, shoot-outs in houses and factories, and a spectacular chase sequence through narrow back alleys and passageways, just to name a few. In fact, no more than about five minutes goes by without some sort of action scene, and numerous as they are, director Yuen is careful to vary them not only in terms of location, characters, and weaponry, but also in shooting style, so they never become repetitious or tedious. In the Line of Duty 4 is many ways typical of Hong Kong action films, not only in that its plot is just an excuse for action, but also in themes it explores, such as friendship and loyalty, and respect for one's elders. Even the rather perfunctory love interest subplot would not be out of place. But it's in the varied and interesting action sequences that the film stands out from others in its genre. Image Transfer Review: The transfer is very good, with bright colors and usually accurate skintones. There is a low level of grain in some sequences, and some edge enhancement, although this is rarely a distraction. Audio Transfer Review: The audio can only be described as "curious". Cantonese and English dubs are offered in both Dolby 5.1 and DTS, but the soundstage is fairly flat in all of them, with little or no activity in the surrounds. The voices seem poorly integrated with the rest of the sound, even on the Cantonese tracks. The one exception is the music, which envelops the listener, and gives the subwoofer quite a workout. The DTS tracks do seem a bit more open than the Dolby tracks, but biggest difference between them is that there's a lot more bass in the DTS versions. Extras Review: All of the trailers are anamorphic, and most of them are in extremely good condition, with transfers that meet or surpass the main feature. While the "original movie trailer" for In the Line of Duty 4 is a bit grainy and has no subtitles, the "new movie trailer" looks great, but appears to be nothing more than cut-together scenes from the movie, rather than a true theatrical trailer. The remaining trailers offer an interesting look at six of Fox's other budget-priced Asian DVD releases, most of them already available. The English subtitles match the English dub track, with the exception of a few deleted expletives. For a Hong Kong film, they're unusually grammatically correct, and there are only a few spelling mistakes. Woo Ping Yuen's In the Line of Duty 4 is an exciting and entertaining Hong Kong police thriller, with a very good transfer and reasonable sound. Forget about trying to follow the plot, and just sit back and watch the varied and fun action sequences.